Absorb yourself into the wonders of Makasutu one of the most spiritual places in Africa. Enjoy Makasutu wetlands, spot native wildlife and boat rides along the mangrove creeks making the journey quiet revivifying. This morning you will travel south ward of the Gambia North- East Brikama Town during the journey your driver guide will ensure that you don’t miss any of the key landmarks along the way. Travel through a local scenery to Makasutu Cultural Forest and enjoy comprehensive commentary of your surrounds. Board a dugout Canoe along the Mandina Bolong and adjacent mangrove creeks in an African pirogue, a wooden dugout canoe made from a single log of mahogany. This is a most relaxing cruise with some wonderful, dramatic scenery of the region's mangrove and palm fringed habitats. The meandering waters are calm and glistening; with lots of silence and serenity, and all you will hear as you drift down the waters are the sporadic bird calls, the constant dipping of the rower's paddle and the occasional chatter of the other tourists. You might spot Mangrove Sun-birds feeding off nectar, and African Darters swimming with only their head and neck above water while hunting for fish, or Lily Trotters walking on the floating vegetation of the mangrove swamp. While along the bush walk you will walk by the hut of a traditional Gambian medicine man that produces and sells herbal potions of traditional medicines and remedies from trees and bushes growing in the area, as well as charms. The holy man or Marabout also reads palms and 'predicts' your future; you could have a chat with him, as he always love a chat with visitors. Further on the trail you will get an opportunity to watch how a palm wine tapper hauls him up a tree using a leather belt (traditionally a palm frond sling) which straps him loosely to the tree, to collect the sweet sap. You will as well get the opportunity to taste the fresh palm. 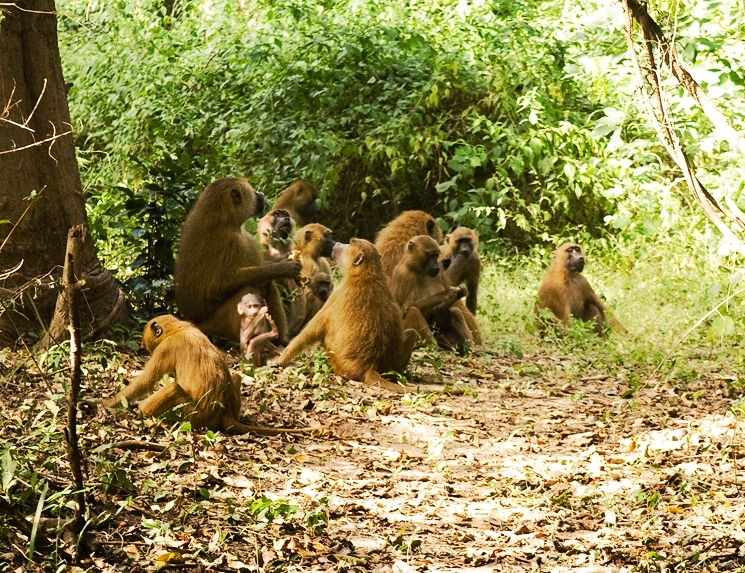 A division of the mammal species you might come across in the various habitats are monkeys such as a troupe of Guinea Baboons, Western Red Colobus Monkeys, Vervet Monkeys. Other animals include the elusive mongoose, bats, squirrels and Dwarf deer. There are as well reptiles such as monitor lizards and crocodiles along the riverbanks and in the water. Among the invertebrates are fiddler crabs, and insects such as ants and termites with more than 100 birds’ species to see. There is an alfresco buffet lunch of organic Gambian food such as rice with peanut soup (Domoda), Jollof Rice with fish and vegetables, served back at the Baobab Restaurant, with its tall, open Bantaba (thatched, shaded structure). After lunch comes the cultural, a group of Makasutu based Cultural Jola dancers and drummers from the nearby Kembujeh Village, start their routine performance on a natural stage, under the gaze of a huge baobab tree. You are often encouraged to join in the dance.